Unfortunately I had a reaction to your products - my face became irritated and very itchy. I do use the quince body cream and I really like that. Sorry to hear you are not 100% satisfied with your purchase. If you'd like further assistance finding the product that's right for you, or to discuss returning items you are displeased with, please give us a call at 800-247-9907 9am-noon and 1pm-4:30pm Eastern Standard Time, Monday through Friday. 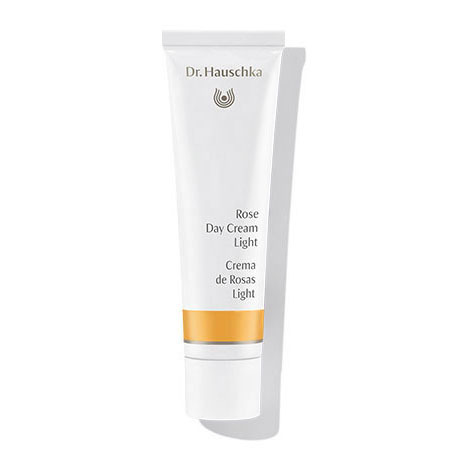 we can also be reached by email at webinquiries@drhauschka.com. This is the lighter version of the Rose Day Cream and it was still too greasy for me. However, it does smell nice and doesn't irritate. I like lots of Dr. H. Products. This is a must-have. Not heavy or greasy, but has enough body to do the job. (I use the regular rose cream on cold winter days as it is heavier but my skin prefers it; it’s almost like a balm and barrier from the drying cold.) It also mixes well w/foundation. I prefer to put foundation on that way rather than straight. I love Rose Day Cream Light! My skin likes it, it is light and non greasy. And it smells divine!!! PERFECT touch over the Regenerating line! While not exactly dry, my skin is a bit sensitive and does lose moisture in my air conditioned office building. A touch of this moisturizer on top of the regenerating line of skin products is absolutely perfect, and makes a lovely base for powder. Highly recommended. Love the Rose Day Cream Light! I love this cream for in the Summer time when it is hot and humid out. Just enough coverage to keep the skin nourished! A must have for my skin regimen! This light cream is smooth, smells beautiful and discreet like roses. My skin feels hydrated and healthy. I have to use only a little cream and it does not make my skin greasy. Lovely fragrance and light texture yet very moisturizing and luxurious. Great for combination skin or summer. Gives a nice glow. Just wish it didn’t contain lysolecithin. I have used the Rose Day Cream and the Quince day cream for a long time but thought I'd try the Rose Day Cream Light because of a promotion that was going on. I wanted something lighter for the summer months but this isn't what I hoped for. It left my skin feeling tacky even though it is very light when you apply it. Sometimes I even get little red spots from it. Really disappointed. I have used both creams the regular and light and I must say, I prefer the regular...I like the hydration to my skin better. Don't get me wrong, this is a great cream but my preference is the regular...even though I live in a very HOT city (Miami) but it gives you this amazing glow of hydration hat I LOVE. I am elder, and have sensitive and dry skin, so I regularly alternate the moisturizers I use. Rose Day Cream Light is as lovely and rich as Rose Day Cream, and smells as sweet. It's a pleasure to use. I usually use the "Rose Day Cream" which I absolutely love! But this is a nice alternative for when I don't want such a thick moisturizer, but it's still just like the Rose Day Cream I normally use. My skin is a bit sensitive so the rose facial products work really well for me, I never feel any skin irritation with these creams and that is hard to come by with a facial moisturizer. I used this cream regularly 7 years ago. I stopped to try other face creams. When I recently came back to use this healing cream for my skin, I wondered why I had even stopped using it. I know it is costly for me but the results on my face are priceless. Thanks for such a great product. Your service with mailings and shippings are quick and efficient. I am a grateful customer. I've been loving this moisturizer for my mature combination skin for daytime summer weather. It soaks into the skin faster than the original and is perfect under my foundation. The original Rose Day Cream makes a great night time moisturizer for me. Love them both! I have the Rose Day Cream, which I like for winter months (I live in VT) but I find it is too thick and doesn't spread as easily as I would like. The Rose Day Cream Light is perfect! Easy to apply. I love using this cream, especially in the spring, summer, and early fall months. In the winter, I prefer Rose Day Cream, but Light version is great for warmer months. I purchased this for my sister. She loves this product, and she feels soft on her face. She will buy this again. I've never had dry skin until I have gotten older. It was always very oily. It is worse in the winter living in a dry climate. I use the Rose Day Cream during this time. However, as the weather warms I still need some moisture but not as much or I will break out. This cream is perfect for me and my skin feels so soft and not dehydrated. Smells GREAT! This product acts like the regular Rose Day Cream, but it's a bit lighter, especially for summertime. I love this moisturizer. 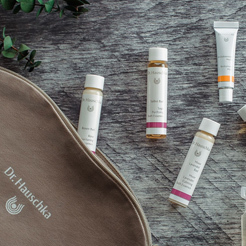 It feels and smells amazing (as do all of Dr. Hauschka products). It is a great moisturizer for combination skin without being as heavy as the regular Rose Day Cream. This works well with the foundation. Again, I wish it wasn't so expensive. Smells delightful and feels greasy going on but it immediately sinks into the skin and provides an emollient that leaves face feeling supple. Just got this, after appreciating the heavier version but needing something lighter. It really absorbed into my skin quickly, and I loved the feel. Used it after my sample of the Revitalizing Mask and OMG--my skin felt great! Now that winter is finally ending I’ve switched from the rose day cream to the light rose day cream and love it. A great warmer weather option. I tried the regular Rose Day Cream, and it was too thick for me. So I tried the Light version, and it is wonderful. Easy to spread on, doesn't look or feel greasy, and seems to hydrate my skin very well. Works really well without being as heavy as rose day cream is. I like rose day cream for extreme weather conditions, but otherwise it is a bit much for my skin. The light version is one I can use any time of the year and still feel the benefits for my skin's condition and appearance. This is the day cream I use when the weather starts to warm up - hopefully soon! Here is a heady whiff of rose that solves the dry areas. To me, it does not help with dehydrations - that's more of an internal matter that only drinking will solve. The scent games into a soft feminine hint, so no worries of a clash with your own perfume. I have used this cream for years.......especially in the summer and also when I need something light on my face. I've used the rose day cream light and regular rose day cream, and the light feels lighter on my face but it still keeps skin great all day. This cream is not bad, it's light, but I prefer the regular rose cream for my skin type, especially during the winter. Super hydrating, love the scent. a marvelous addition to the classical rose cream but its not just a 'diluted" version of the richer classic. This cream stands on his own as a wonderfully soothing product , great for summer or indoors and definitely suitable under makeup, for all age groups, a must have ! I use this cream in the summer and in warmer weather. I also use it in combination with Rose Day Cream for the oilier parts of my face where Rose Day Cream is too heavy. It makes my skin soft and keeps redness away, which happens often with my sensitive skin. I'm sure this product is great for the right skin type. I switched back to the Melissa Day Cream (which I love). The Rose Day Cream Light just makes my face too oily. I broke out all over. Again, I'm sure it's a good product for the right skin type. I use the Rose Moisturizer for most of the year, but I find the Rose Light really lovely for summer months. I use more SPF in the summer and find myself wanting something lighter. It has a lovely smell and works well with a light foundation as well. This is an amazing daily moisturizer that delivers on all of its promises. It goes on very easily, absorbs quickly, hydrates perfectly, and leaves the skin looking smooth and velvety. Is smells like a garden of roses. I could not recommend this highly enough. This small size i got seems to be a bit more watery than the full size :-( Anyways, I use this one during the summer as I use their Day Cream during the winter. I use this cream under a sunscreen all summer. It's very lightweight and yet still does a great job hydrating my skin I highly recommend it. I love the smell of this cream, the scent is so subtle and lovely. Even the light version is heavy enough for my skin, and hydrates very efficiently. I am truly loving every single new product i buy. I bought this rose day cream by mistake actually I was using the tinted day cream and wanted to buy it again, no problem because I love it anyways. I bought the Rose Day Light Cream and within the first week I've used it I and everyone else noticed the glow on my face from it. Your face instantly feels so soft. I recommend it, I love it! Rose day cream light smells good and it has light texture on the skin. It's good choice for summe time. This feels luxurious, but comfortable. Lightly fragranced with roses and nice texture, it sinks right into the skin and keeps the skin balanced--no greasiness. I purchased it for summer use. I mix it with the Dr. H tint and bronze liquid for a perfect summer glow that lasts all day. A keeper. Each morning after cleansing and toning, apply evenly to face, neck and décolleté with a gentle pressing motion. In general, a pea-sized amount offers enough product. For maximum benefit, apply while skin is still moist from toner. In the evening after cleansing, tone with Facial Toner then apply Night Serum as your final step. For deeper nourishing care, we recommend weekly applications of Soothing Mask or Revitalizing Mask. In the colder months, the skin needs extra care. Try rich, protective Rose Day Cream.